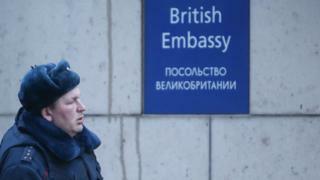 Moscow has vowed there will be a swift response to the expulsion of 23 of its diplomats by Britain. President Vladimir Putin would make a final decision and "won't take long" to respond, his spokesman said. The UK took its action after Moscow refused to explain how a Russian-made nerve agent was used on a former spy and his daughter in the UK. Russia denies it was involved. Its foreign ministry called the allegations by Prime Minister Theresa May "insane". On Thursday, the leaders of France, Germany, the US and UK issued a joint statement on the attack, condemning the "first offensive use of a nerve agent in Europe since the Second World War". What have the Russians actually said? Foreign Minister Sergei Lavrov has been speaking on the issue at an event in Moscow, although Russian media reports of what he has said have been conflicting. The RIA Novosti agency quoted him as saying Russia would "definitely" expel UK diplomats "soon". But he was quoted by others as saying that Russia would inform British authorities first before any media announcement. "This is, in my view, being polite; this is how gentlemen behave," he said. Mr Lavrov was also quoted by Tass as saying he hoped the former spy, Sergei Skripal, would recover so he could shed light on events. Interfax quoted the foreign minister as saying a motive behind the UK's actions might be to complicate Russia's hosting of Fifa's World Cup this summer. President Putin's spokesman, Dmitry Peskov, said the foreign ministry was working out measures but added that "it is indeed the president who will make the final decision". 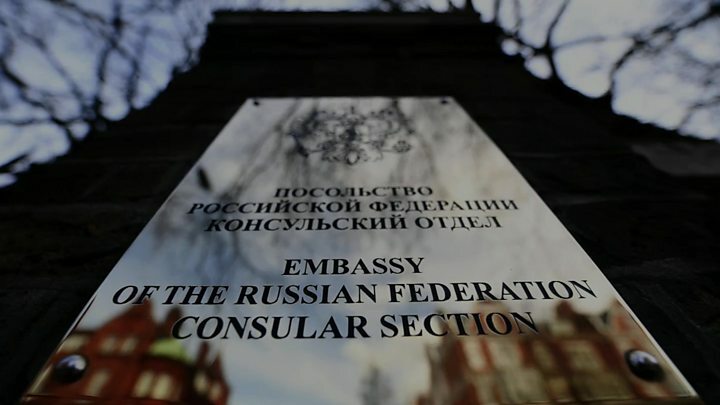 Foreign ministry spokeswoman Maria Zakharova condemned what she said were "absolutely insane accusations made by the UK prime minister against Russia", adding that the UK had failed to provide any factual information about the case. She said diplomatic notes sent to the Foreign Office had received replies that "made no sense". What is the latest from the UK? Foreign Secretary Boris Johnson stepped up the war of words with Russia on Thursday. He said the attack was Russia's "way of saying to people this is what happens to people who stand up to our regime". Mr Johnson said: "Now is the moment for Putin to jam the lid down and send a signal to people: 'You do this, you're going to die'." He told the BBC a sample of the nerve agent would be sent to the Organisation for the Prohibition of Chemical Weapons - the independent international body set up to stop chemical warfare - for analysis. But he added that Russia's "smug, sarcastic" response indicated their "fundamental guilt". Moscow wanted to "simultaneously deny it and at the same time to glory in it", he said, adding the nerve agent was chosen "to show that it is Russia". Defence Secretary Gavin Williamson said Russia "should go away and should shut up". Sergei Skripal, 66, and his daughter, Yulia Skripal, 33, were found slumped on a bench in Salisbury, Wiltshire, on 4 March and remain critically ill in hospital. The chemical used in the attack has been identified as part of a group of nerve agents developed by Russia known as Novichok, Mrs May said. 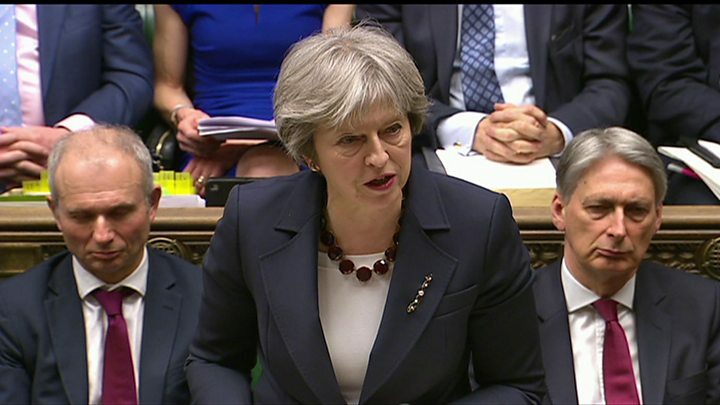 The prime minister, who visited Salisbury on Thursday, said there was "no alternative conclusion" than to believe Russia was "culpable" for the poisonings. She had given Russia a deadline of last Tuesday evening to explain the use of the nerve agent. Mr Lavrov then said Moscow would co-operate if the UK submitted a formal request under the Chemical Weapons Convention, which gives a 10-day time limit to respond. But after Tuesday's deadline passed, the UK announced the expulsions. In addition, the UK has announced measures that include increased checks on private flights, customs and freight as well as a boycott of this year's Fifa World Cup in Russia by ministers and the Royal Family. How have other nations reacted? Thursday's four-nation joint statement said the western allies shared the UK's view that Russia was responsible. "Russia's failure to address the legitimate request by the UK government further underlines its responsibility," it said. "We call on Russia to live up to its responsibilities as a member of the UN Security Council to uphold international peace and security." Earlier, French President Emmanuel Macron said he would announce unspecified "measures" in the coming days over the poisoning. He said: "I condemn in the strongest possible terms this unacceptable attack. Everything leads us to believe that responsibility can be attributed to Russia." On Wednesday, the White House said it "stands in solidarity" with "its closest ally" the UK and supported its decision to expel the Russian diplomats. President Donald Trump's spokeswoman accused Russia of undermining the security of countries worldwide.